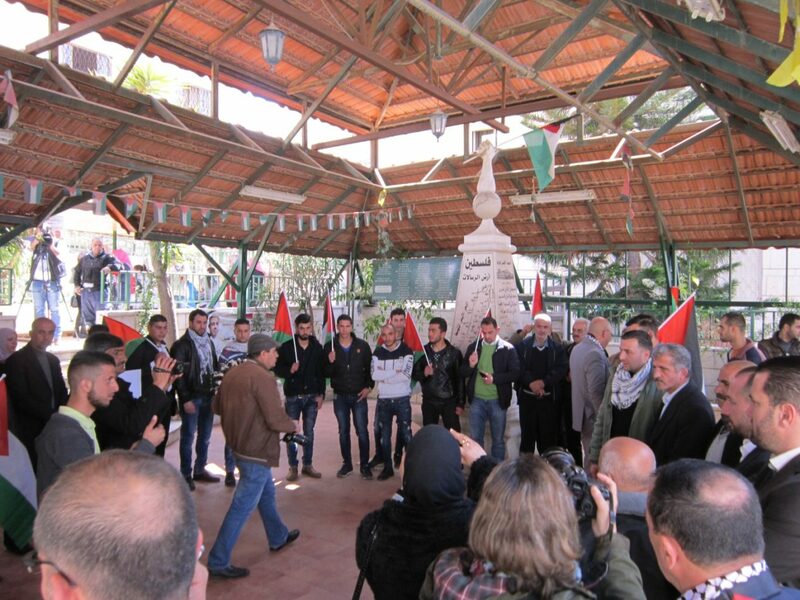 On a warm, sunny, Sunday noontime, 26 February 2017, at The Martyrs’ Cemetery on a hillside in Hebron, groups of Palestinian community leaders, political officials, the press, school children, members of the community and international observers gathered to remember the 29 lives that an American-Israeli settler, and doctor, took Friday, noon, 25 February 1994. The men whose lives the Israeli took were praying in the Ibrahimi Mosque, the site of the cave tomb of the Patriarchs, Abraham, Isaac, and Jacob and their wives, Sarah, Rebecca and Leah. They were not “martyrs” to their Muslim faith, to a cause for Palestinian independence or in resistance against the illegal, immoral Israeli occupation of the West Bank. It was Friday noon. The 29 came, as usual, to pray. They did not think to “give” their lives. The Israeli settler, with his automatic rifle, took their lives. He didn’t ask. They didn’t agree or resist. He just took their lives. Just as those 29 men could not imagine the enormity of what has about to happen to them, we could not grasp the reality of what did happen. As we walked to the Cemetery, the first days of spring brought blooms to the almond trees that dotted our route. Perhaps the same trees bloomed in 1994. Life and beauty announced their presence at the same time that death and ugliness entered the Mosque. School girls in their white head scarves and uniforms entered the Cemetery one-by-one to pay a tribute that they little comprehended but did dimly understand from the midst of the ugliness and menace of the Israeli occupation that surrounds their lives. Politicians came. Their encounters with the forces of the Israeli occupation of their community helped them to better comprehend and to place these 29 lives/deaths in the context of the many lives of other members of their community that the Israelis have taken. They also knew the benefits that accrued to politicians who spoke at, were photographed at and who were interview at places and times like this one. Posturing and genuine sorrow intermingled. Some came bringing flowers and wreaths to express their sadness at the unrealized beauty of the 29 lives taken. Lives taken in the sacred space of the Mosque. Lives that, somehow, now make sacred this Martyrs’ Cemetery and this gathering. Many took photos. A young man passed around offering cups of coffee. Women, who understand more about birth and death than men, talked quietly among themselves. Children slipped in and out. Over it all brooded the palpable presence of the spirit of the 29 and their, all too many, companions in death. We make sacred their sacrifice through the commitment of our lives to resist the hatred and lack of understanding that led to their deaths. To replace malice and injustice with genuine human community. In remembering, we are reminded of both their sacrifice and of our task.